Customer service is more important than ever with the popularity of social media. One bad experience can go viral, tarnishing a business’s reputation. Solving a customer’s problems quickly and efficiently results in happier customers and brand loyalty. Help desk software is an essential part of solving your customer’s problems, and today we’re going to look at Zendesk alternatives to help you find the right software for your business. These alternatives will help your business create a user-friendly, global help desk that eliminates the loss of money and time spent on traditional help desk solution. Before the cloud became prevalent, a company’s help desk software was installed and configured on-premise by the IT department. Support teams had to work from one centralized location and any updates or troubleshooting was the responsibility of the IT department. A cloud-based help desk is a modern innovation that allows businesses to deliver a superior customer experience by creating a decentralized, global help desk and eliminating the need for IT support or on-premise installation. Zendesk was founded in 2007 by three friends in a loft with one goal in mind: create an easy-to-use help desk software that doesn’t require an IT department or a consultant to set up. While it is one of the leading help desk solutions, it’s always a good idea to shop around for alternatives. We’ve covered many alternatives before when it comes to cloud collaboration tools, and we’ll be exploring Zendesk alternatives today. We’ll explore the following alternatives to Zendesk: Freshdesk, Desk.com, JIRA Service Desk, Kayako, and Teamwork Desk. Why do we choose basic (Essential) "per agent per month" plan for price comparison? Zendesk pricing starts at $5 a month and that’s where we start our price comparison. The “Essential” plan as they call it offers only the most basic features and the next step up is their “Team” plan which starts at $19 and adds more features. While the “Essential” plan may seem like the cheapest option at first glance, it’s important to know what features you need for your business’s help desk. Most offer a free trial which is a great way to test before you commit. We’ll help you compare features and find the right help desk solution for you. The “essential” plan includes unlimited email support for your customers. It integrates with social media widges via Facebook and Twitter. You can create a Knowledgebase so customers can help themselves. FreshDesk offers unlimited email ticketing to resolve customer’s issues. The “sprout” plan includes the basic Facebook and Twitter integration features. FreshDesk’s basic plan also includes a Knowledgebase. A basic Desk.com plan includes a Knowledgebase as well as Community Q&A. Like others, the starter plan includes unlimited email ticketing. You get Facebook and Twitter integration for one account. Even the small plan includes performance tracking metrics and analytics. It supports many add-ons and easily integrates with other tools. Kayako’s Inbox plan includes email ticketing, chat, and social media integration. Rules to automatically assign tickets to specific agents. Customer self-service portal including suggestions and customer requests. Teamwork Desk offers smart inboxes and ticket assignments. They include one free “Help Docs” site, charging $20 per addition site. You can also enable per-inbox surveys to gauge customer satisfaction. Freshdesk has a lower price than Zendesk, although Zendesk offers a little bit more for large enterprise customers, such as advanced training classes. Ticket management is an essential part of help desk software, and Freshdesk has a unique feature called “Freshdesk Arcade”. It essentially rewards agents for solving tickets, writing articles for the knowledge base, or responding to forum posts with various badges and rewards. Freshdesk’s Sprout plan, unfortunately, doesn’t include a live chat channel, unlike Zendesk which offers one concurrent live chat session on the Essential plan. Freshdesk makes up for this, perhaps, by offering standard phone support as part of their Sprout plan. Phone support is offered by Zendesk as a separate service. Information Technology Infrastructure Library (ITIL), a set of best-practice guidelines for IT services, is another area where Freshdesk has the edge. If your business needs to uphold SLAs or follow ITIL guidelines, Freshdesk is your best option. When it comes to building a knowledge base, both Zendesk and Freshdesk offer excellent features to customize your self-service portal. Zendesk’s Essential plan includes customizable templates. Freshdesk allows custom HTML/CSS, and includes a “Rebranding” page for customizing logos and more. As far as pricing, Freshdesk’s Sprout plan is free. The next step up is their Blossom plan, starting at $19 a month per agent, on par with Zendesk’s Team plan. While Zendesk has been established longer, Desk.com has quickly grown since being acquired by Salesforce. Desk.com offers a Starter plan at $3 a month, slightly cheaper than Zendesk. When it comes to comparisons, the Desk.com interface is modern and elegant, on par or better than Zendesk, as some users find Zendesk to be clunky. This largely boils down to user preference, so you might want to give both trials a test to see which interface you like better. Desk.com includes excellent social media support, whereas Zendesk seems to have added it as an afterthought. You can easily monitor your brand across social media with Desk.com. Customization is easier and free with Zendesk, as they offer tools to make the process easier. You can configure and customize Desk.com but this is a paid-for option not included in the Starter plan. If support is important to you, Desk.com only offers support for Standard, Pro, and Business accounts – no support offered for the Starter plan, which puts Zendesk ahead here. Live chat is also missing from the Starter plan, though Zendesk’s Essential plan limits you to one chat session at a time. If live chat is a needed feature, both Zendesk and Desk.com are almost even when you consider you’ll want the next plan up: Zendesk is $19.99 while Desk.com is $20. Jira Service Desk starts at $10 a month per agent, more expensive than the other alternatives we’ve discussed so far. It’s also limited in features compared to Zendesk, but offers add-ons via the Atlassian Marketplace. Jira was originally designed for tracking issues in software development, but has been expanded to work as a help desk. One benefit Jira Service Desk offers is ITIL compliance, making it a perfect match for IT departments which follow the ITIL guidelines. In the mobile area, Zendesk comes out on top — they offer iOS, Android, and Windows phone apps, whereas Jira is limited to the web app. If you don’t need mobile agent support, this might not matter to you, but it’s something to keep in mind. Jira takes more time and effort to configure than Zendesk and seems better suited for internal work and software developers. If you need a customer-facing help desk as well as a tool to manage your business’s internal teams, you can use Zendesk to create a help desk for your customers while relying on Jira for internal processes. It’s seamless to integrate both Zendesk and Jira in your business. Zendesk tickets can create Jira tickets for developers, so they can track issues and debug software. Kayako starts at $9 a month per agent, and while it’s more expensive than Zendesk it puts more emphasis on your customers. You can view timelines with specific customers, including tickets, conversations, purchases and billing info, contact information, and recent feedback. Kayako lets you pull data from over 500 other business apps to learn more about your users, letting you learn more about them without switching between a dozen apps. You can include anyone in your business, for free, into a conversation to help resolve a ticket. Kayako also offers automatic, canned responses if you need to reply to similar tickets repeatedly. When it comes to help desk features, Kayako offers more with their basic plan: live chat, up to four email or social media accounts per inbox, and proactive live chat rules. You can customize your knowledge base, including a customer request portal, and offer automatically suggested answers for customers. Both Zendesk and Kayako offer great help desk solutions, but Kayako comes out ahead with live chat, integration with all of your departments, and the heavy focus on customers as individual users. Teamwork Desk starts at $5 a month per agent, putting it on par with Zendesk as far as costs go. Teamwork Desk is relatively new and not quite as feature rich as Zendesk, although this simplicity makes it very easy to use. The software uses a unified inbox, which collects a selection of inboxes presented at once, making it easy to see the status of all tickets by category. When it comes to the knowledge base, Teamwork Desk relies on what they call “Help Docs” sites. You can customize your site with CSS or other settings to match your brand, and Help Docs creates reports showing how your customers interact with your knowledge base. The insights from these reports will help you tweak and configure your site to better suit customer needs. If you want features beyond the basic account, the next plan starts at $20 per agent per month. They offer a “Startup” plan, but it charges per ticket, not per agent. The Startup plan has the same features as Basic, except you’re limited to five agents and three inboxes. If your business has a low volume of tickets, few agents, and doesn’t need more than three inboxes, the Startup plan might be a cheaper option. Keep in mind the per-ticket pricing, as a sudden influx of tickets will greatly increase costs. 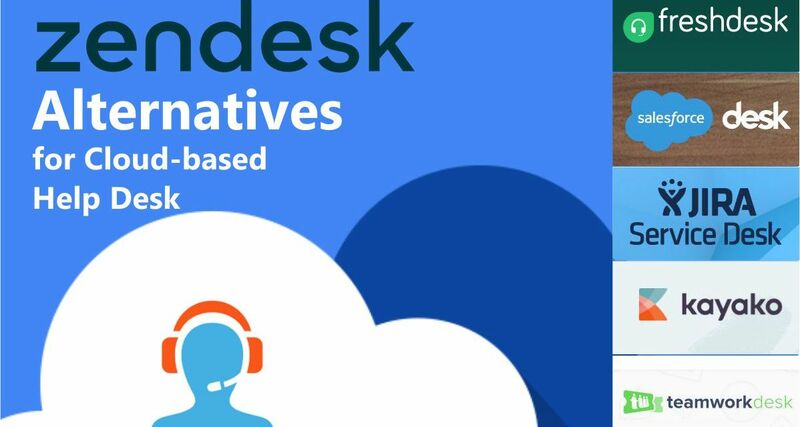 Zendesk is a great solution for a cloud-based help desk, but there are plenty of excellent alternatives as you’ve seen today. Take note of what you require in a help desk so you can find the right Zendesk alternative to match the needs of your growing business as well as your budget. Hi James! Thanks for the comparison. I’d also add a software system Deskun, it’s working with email, live chat, and messengers, and I think it might be a good replacement of Zendesk. We’re going to review Deskun alternatives soon. Feel free to contact us with any thoughts regarding that matter.